Stand Up Paddleboarding or SUP, is shooting off in so many different directions at the moment its hard to keep track of it. But one area that I have been keen to explore, especially as I am an instructor, is Whitewater! After a nice Autumnal trip down my local stretch on the Bristol Avon, and with river levels higher than normal, we came across a weir, normally well known for its ‘playwave’ by the kayaking community. 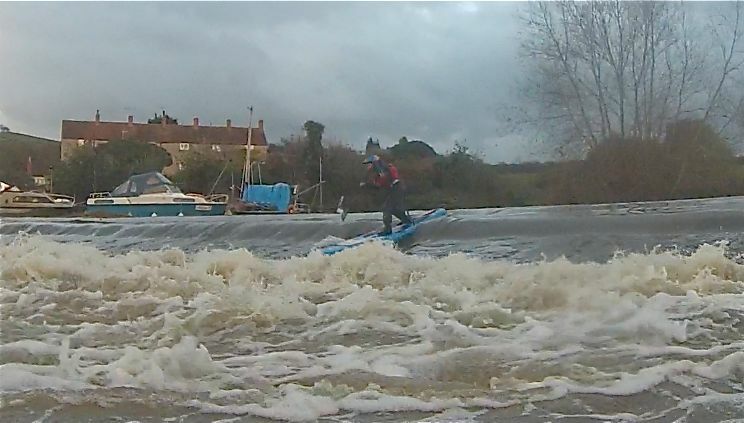 The water levels had covered over the playwave, but it had been replaced by a decent amount of water flow, allowing the potential for a SUP to get over the weir. We just so happened to be on the river with Chris Bond, a local who knows the playwave well, so with his knowledge we assessed the risks and picked our lines we would take over the waterfall. Chris offered to go first to test out the conditions, so he popped the fin off his Red Paddle Explorer board, and after a lot of nervous smiling he made it down in one piece. The challenge was on for me to give it a go, and after kitting up in an essential helmet, I headed to the top of the waterfall. Paddling up to the top of the falls for the first time is always a nerve-racking thing, but I picked my line and went for it on my knees. It was a smoother ride than I thought it would be and the Explorer board sailed through the choppy whitewater at the bottom. With this in mind I decided it was time to go over the waterfall standing up. This time I really was nervous as it had never been done standing as far as we knew. I paddled up tentatively, making sure to get my line correct, took a deep breath, smiled to the onlookers and went for it. Going over the edge of any waterfall, however high, is exciting, and staying on my feet as I sloshed through the turbulent water the the bottom was immense. So much so that I gave my war cry as I made it through, followed by some amazed cheers from the others! I was stoked for quite a while after that, and I think it may well be the start of something very exciting! A word of warning about Whitewater SUP, as whitewater can be dangerous! Please don’t just go to a weir or waterfall and go over, it will potentially end badly. If you like the look of this, get in touch with your local SUP club or instructor and ask for advice, and always go with someone trained in whitewater rescue! This sport is very exciting, but can also be very dangerous! If you do give Whitewater SUP a go under the conditions above, we would love to read about it, so post your comments below.